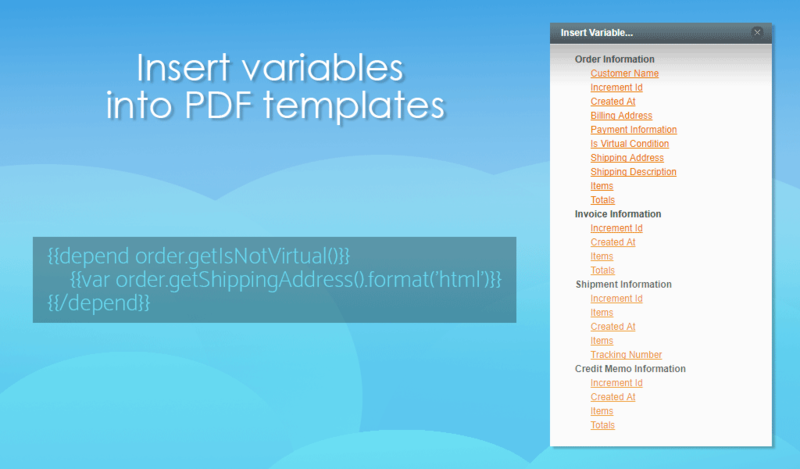 Native Magento PDF templates hardly can be customized. Modifying templates via Zend PDF is like using MS Paint for painting - it is very dumb, it does not support HTML, CSS or any other markup. 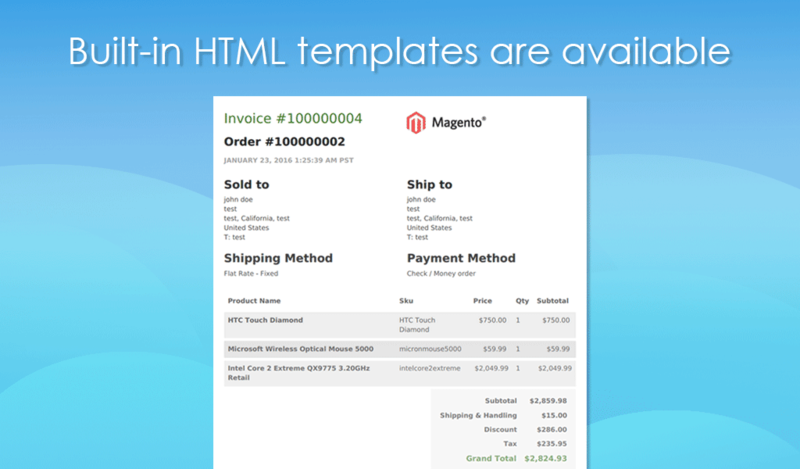 With Invoice PDF Customizer extension for Magento, you can convert any HTML code to a PDF file. Invoice is an official document, and it should contain a well-defined information about a buyer, seller and purchased items. 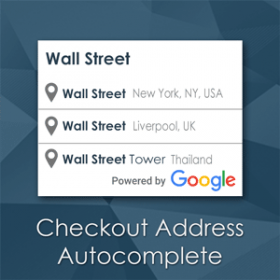 Order templates (invoice, packing slips, etc.) 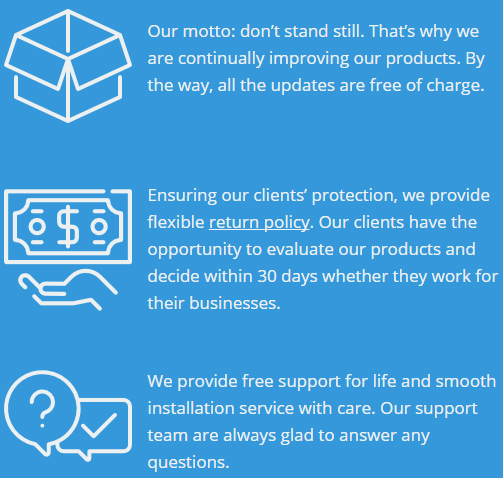 should also contain a lot of other obligatory information, such as your website logo, company address information, tax details, return policy and so you. Make your PDF files stylish and fit your brand! You can change fonts, colors, layout, insert images. 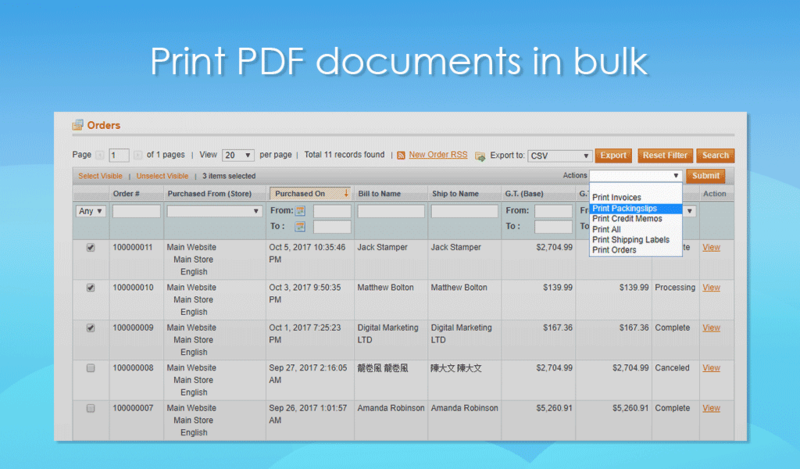 You can do everything with Invoice PDF Customizer Magento extension. 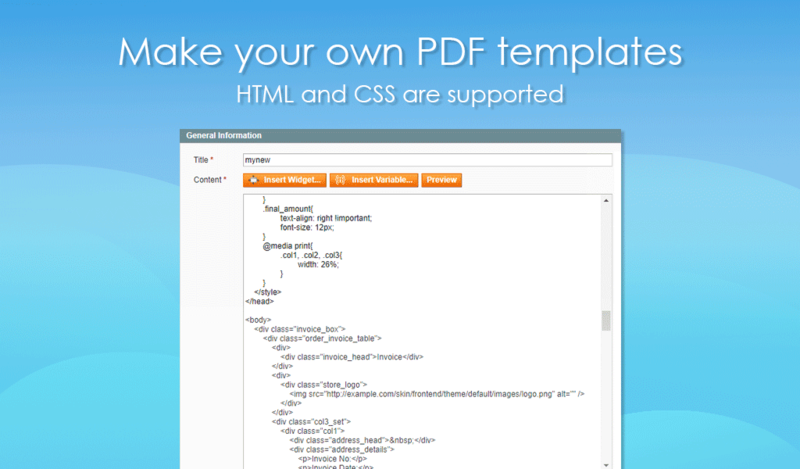 Convert your HTML and CSS code to PDF templates. Full freedom for your design ideas! 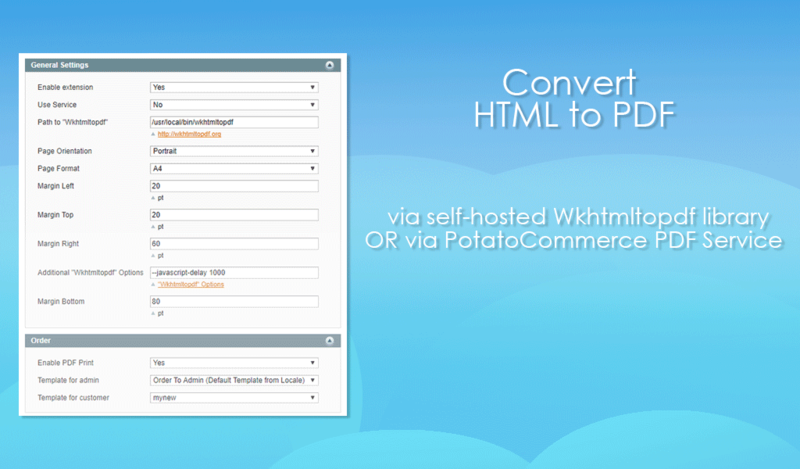 PDF Customizer Magento extension uses wkhtmltopdf library to convert HTML/CSS to PDF templates. You can install wkhtmltopdf on your own server, or (if you can't do that because of any limitations) you can use Potato PDF Service. How does it work? 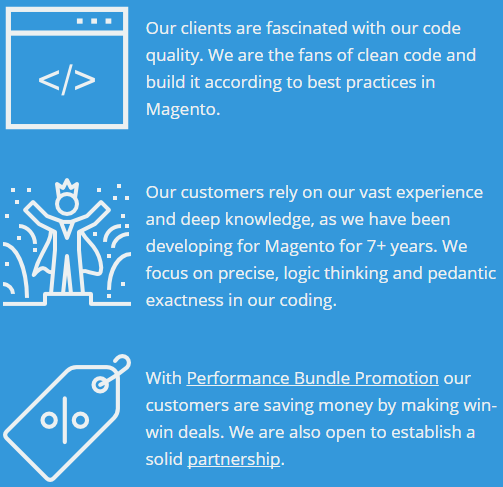 PDF Customizer extension sends your templates and order information to our server, and then PDF files are returned to your Magento store. 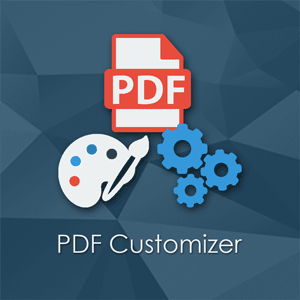 We would like to customize our PDFs and it was so easy with this plugin. We also used Foomans Email PDF attachments, wich send PDF to customers directly. PLugins were not compatible, but the Support Team makes a miracle and it works fine now! Thank you a lot, especially to Anastacia. Cheers! Very good extension, no any bugs found. Anastasia was very friendly, she answered all my questions quickly. Great support and even better extension! I wanted to have different templates for admin and for buyers - and this extension helped a lot! It is easy to change templates, even a novice can use it (basic stuff). Nice extension and excellent support! I've spent hundreds of dollars on a developer from Odesk who was trying to customize default order pdf templates, and the result was not as good as I wanted. Then I tried to find another way out. I tried this extension and it met my requirements. The one thing that I love about this extension is that I can customize PDF templates by myself, although I am not a programmer at all! Go to extension configuration (System > Configuration > PotatoCommerce Extension > Print PDF ), enable and configure the extension. Install wkhtmltopdf on your web-server. You need to use at least 0.12.2.1 version of the library. Wkhtmltopdf installation guide is available on this page. You also need to enable "exec" function. The extension will check if the library is installed and whether it can run "exec" function; it will let you know if something goes wrong. Use wkhtmltopdf installed on our server. In this case please set 'Use Service' option to 'Yes'. Path to "Wkhtmltopdf" is a full path to wkhtmltopdf library. Page Orientation and Page Format - These option set page orientation like (Portrait/Landscape) and page format (A4/Letter) for PDF templates. If you need more formats please let us know. Margin Left, Margin Top, Margin Right, Margin Bottom - These options set margins for PDF templates. How to create and modify templates? 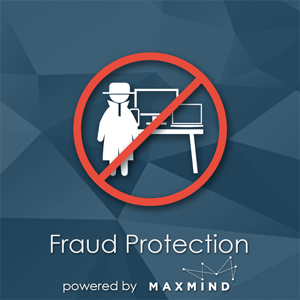 Please do not modify default templates at app/locale/en_US/template/pdf because those files will be overwritten once you update to a new version of the extension. If you ever changed them, then make a backup of that modified templates prior to making an update. We recommend creating new templates basing on default templates or from scratch. 11. Go to extension configuration (Sales > Print PDF > Settings) and select the template you’ve just created, which is “Invoice > Template for Customer” in our case. If you need to use Farsi, then you just need to add appropriate encoding and other meta-tags to a template. 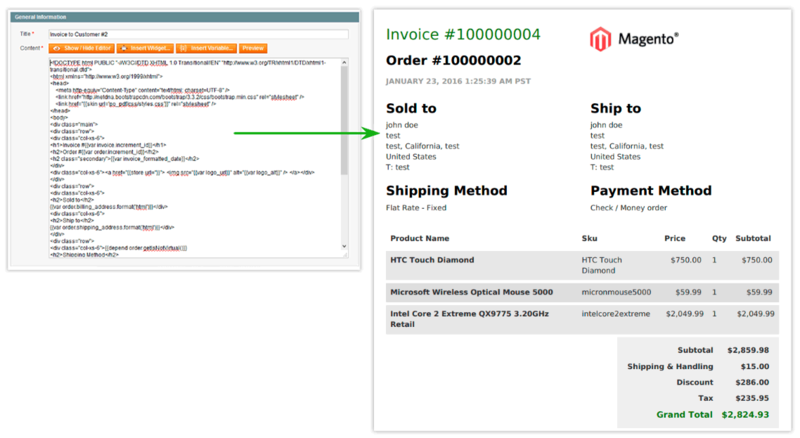 By default extension uses data from the first met order (invoice, shipment, credit memo). But if you need to test template for a particular data, then you can specify its data at Sales > Print PDF > Settings > Preview. Why does your extension use Wkhtmltopdf library? Unlike TCPDF which has a lot of limitation, Wkhtmltopdf has no limitations. You can use any HTML & CSS code in your templates. 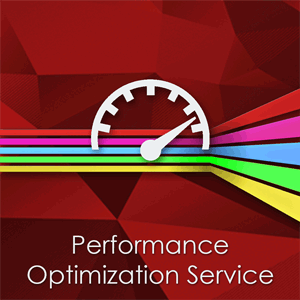 Wkhtmltopdf works faster because system utilities work faster than PHP-script. Is there any HTML tags that I can’t use? No, you can use any HTML or CSS code in your templates. You can insert any blocks or widgets as well. 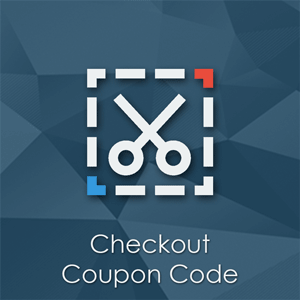 How can I add Bar-Code/QR-Code to a template? Our extension does not insert bar/qr-codes itself. But if you have some kind of 3rd-party widget or variable that generates such qr/bar-codes, then it can be added to a template and will be successfully handled by our extension. Does your extension support multi-store? Yes, it does. To set some template for a particular storeview you need to select scope at Sales > Print PDF > Settings and specify the template. Is it compatible with SUPEE-6788 security patch? How to add Arabic / Chinese / Russian / etc. language support?